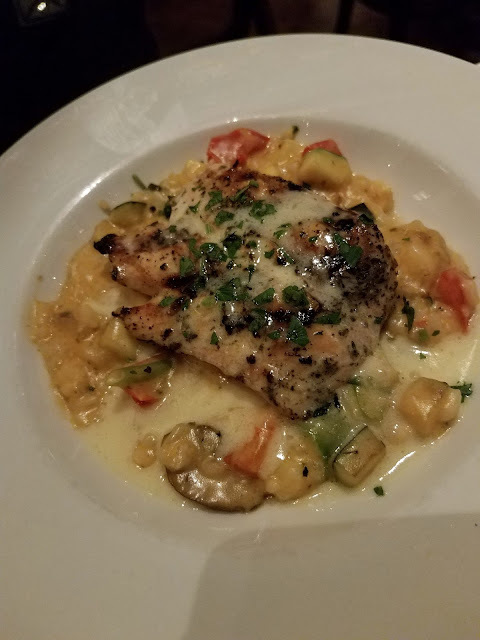 This last week my husband and I had the privilege of dining at BRAVO! 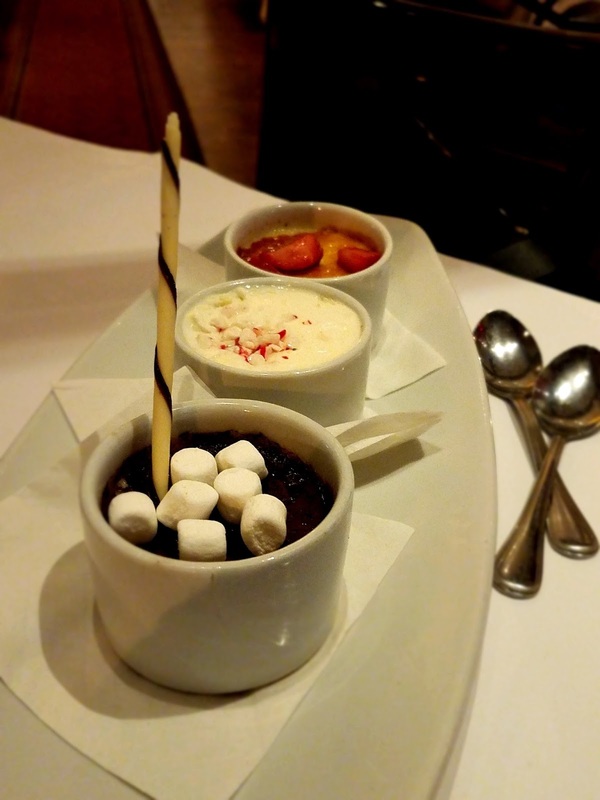 Cucina Italiana to try their new chef inspired flavors for the holidays. FYI: The limited time Two Course Combo Holiday Menu including Holiday Cocktails is available until 12/29/17. As we were being taken to our table I took notice of some festive little changes to the dining room. From a classic Christmas tree in the far dining room to large snowflake patterns in the bottom of the large pendant lights, the decor was simple and elegant. 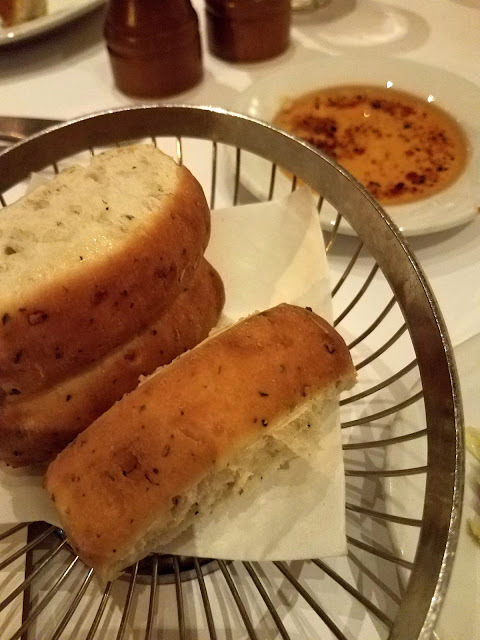 We began the meal with the delicious warm bread and seasoned herb olive oil. You can purchase this to take home in an 8.1 fl. oz. bottle for $6.99 *price may vary. Stop into your local Bravo now through Dec. 13th for 20% off dipping oil! Since we would be trying all three entrees, we decided on just a chopped salad for a starter. It was not something I would usually choose as I don't normally like olives but it was bright, fresh, and served really cold, exactly how a salad should be. Great start. 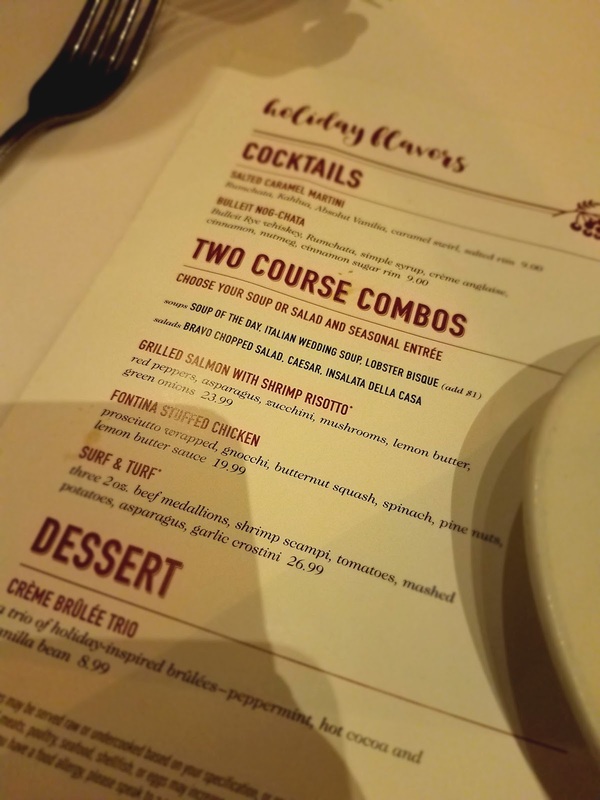 At the advice of our server (Todd, who was amazing, but I will get more into that later) we decided to take on the three holiday menu entrees as three separate courses. The first he brought us was the Grilled Salmon with Shrimp Risotto. The risotto was so creamy and had red pepper, mushrooms, zucchini, asparagus, green onions and lemon butter. The shrimp was perfectly cooked and burst with every bite. The grilled salmon had a delicious char and the whole dish came together in a great balance. It was my husband's favorite of the night. 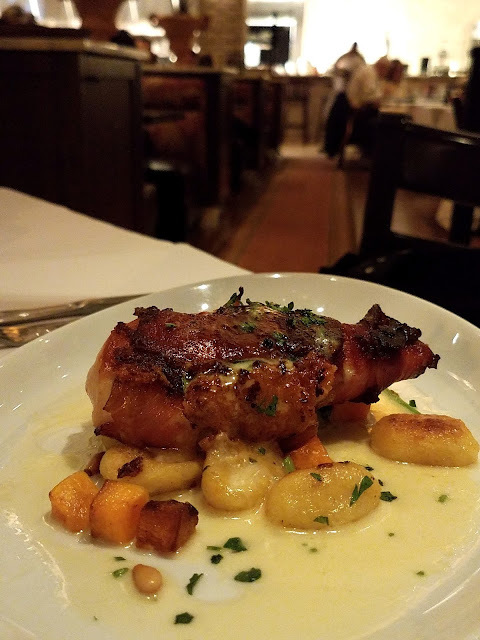 The next dish brought out for us was Fontina Stuffed Chicken wrapped in prosciutto served with gnocchi, butternut squash, spinach, pine nuts, and lemon butter sauce. Let me start by saying this was my favorite. The chicken was cooked perfectly with crispy bits of melt in your mouth prosciutto, tender chicken and oozing fontina cheese making for one amazing bite. When you added to that bite a pillow of soft pan fried gnocchi, sweet bit of squash and crunch of a pine nut you achieve a flavor and texture milestone that is not often met. It was a truly exceptional dish. The final entree of the evening was the Surf and Turf. Three 2 oz. 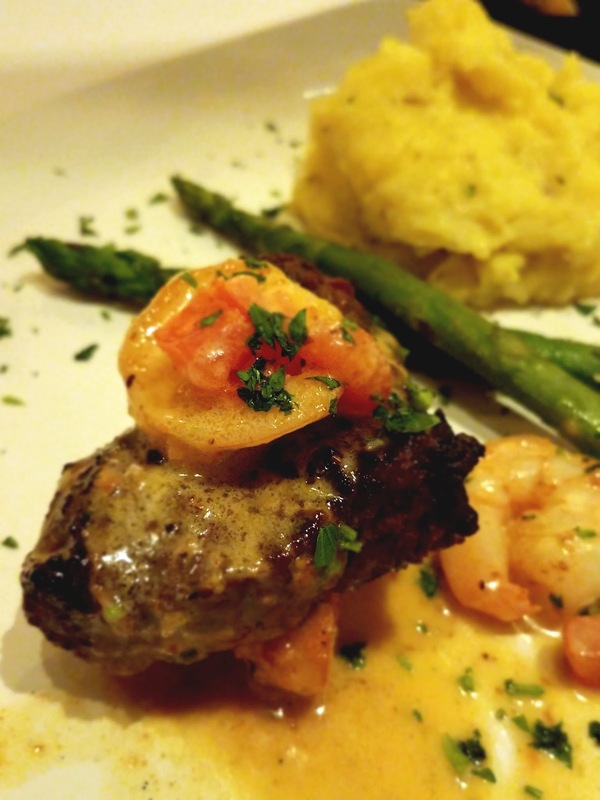 beef medallions served with shrimp scampi, tomatoes, mashed potatoes, asparagus, and garlic crostini. The beef was cooked to our liking and was incredibly tender. The shrimp and asparagus were expertly cooked as well. The potatoes were good but maybe a bit dry and over whipped. I think the dish would have been improved if the medallions, shrimp, and asparagus were served on top of the bed of potatoes without the crostini, but that is just my opinion. We had planned to finish our meal with both the artisan cocktails and the creme brulee trio but alas, we had room for only one and the creme brulee trio was our top choice. Three holiday inspired brulees - peppermint, hot cocoa, and vanilla bean. My favorite was the vanilla bean with the strawberry slice on top but the peppermint and cocoa tried together was quite good as well. We need to go back soon and try the Salted Carmel Martini and the Bulleit Nog-Chata that is for sure. Now I know most are not going to be able to make it the Grand Rapids, MI location but I cannot write about our visit without mentioning Todd more. We have never been pampered at a restaurant the way Todd pampered us. Even more amazing is that he had a trainee at the time and yet we were able to enjoy our experience and not have to worry about a thing. His attention to detail and awareness of needs you didn't even know you had made him the best server we have ever had. We will be back!